Viewers in parts of the Scottish Borders will become the first affected by a three-year nationwide programme to move some Freeview channels to new frequencies. On the 1st March 2017, the BBC's standard definition TV channels on Freeview will begin to be broadcast on a new frequency from the region's main transmitter near Selkirk, requiring viewers to retune to continue receiving all BBC TV services. The changes also affect anyone using a YouView or EE TV box to receive their TV services, thus including anyone on BT TV, TalkTalk TV or Plusnet TV in the area. It's the first stage of a campaign to move Freeview channels from frequencies in the 700MHz band by May 2020, as these frequencies are due to be used by new mobile services from then on. Selkirk transmitter users were also at the forefront of the original digital switchover campaign in 2008, when Selkirk became the first main transmitter to lose analogue TV services. Viewers who receive Freeview from a relay, and thus only receive some Freeview channels (i.e. not Sky News or Dave, for example) are currently unaffected, according to Digital UK, the company responsible for managing terrestrial television in the UK. On the morning of 1st March (after 9:30), BBC standard definition TV services from Selkirk start broadcasting on a new frequency - UHF channel 32. BBC TV services will continue broadcasting on their old frequency (UHF channel 50) until 29th March. Viewers should retune as soon as they can after 9:30 on the 1st March. If, after a retune they can receive BBC One Scotland on channel 1, and a duplicate version on channel 751 (from the old frequency), they are ready for the change. The duplicates will disappear from 29th March. If, after a retune they can't receive BBC One Scotland on channel 1, or reception of the channel is poor then a new TV aerial may need to be installed. This is because the new frequency is out of the range supported by some older "group C/D" aerials installed in the area. New wideband aerials are recommended. BBC TV channels can continue to be received on channels 751 upward until 29th March via the old frequency until these are turned off. Viewers who normally watch BBC One Scotland HD on channel 101 will need to check if they can also still receive the standard definition service: this is important because the HD services will also move in the future, and viewers need to know that their aerial is suitable. Based on Digital UK information. The retune will act as a pilot and authorities will be monitoring carefully how many households have difficulties receiving BBC TV services on the new frequency before similar retune events take place in the rest of the UK. 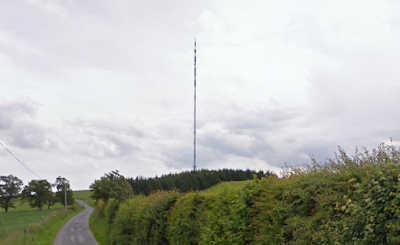 The event in March takes place despite the neighbouring Caldbeck transmitter in northern Cumbria using the same frequency for commercial HD services, but it's believed the hills will stop co-channel interference. The Borders region is particularly affected by the decision to move TV services out of the 700MHz frequency band to make way for mobile services because the Selkirk TV transmitter currently broadcasts all of its Freeview service in the affected frequency band - on UHF channels 50, 53, 55, 57, 59 and 60. Broadcast regulator Ofcom has determined that TV services need to be out of this frequency range by May 2020. As a result, the Selkirk mast is being re-engineered so that it will broadcast Freeview services on UHF channels 32, 33, 34, 35, 36 and 48, in the upper 500 and 600MHz frequency band. Therefore, any viewers that lose BBC services in March will risk losing other Freeview channels when the other retunes take place in the future if they don't upgrade their aerial. Consumer support will commence on 14th February, with a contact telephone number becoming available for viewers to report reception problems with BBC channels. As the frequency change is due to new mobile network services, Digital Mobile Spectrum Ltd, a company set up by the mobile network operators will be responsible for providing support, although details of how and if households will be compensated for the inconvenience haven't yet been published. Digital Mobile Spectrum Ltd already operates "at800", a support service to households who have been affected by Freeview interference from new 4G mobile services that have since 2013 taken up some of the former TV frequencies. Similar retune events will take place from July 2017 onwards in other parts of the UK, starting with northern Scotland. Exact dates are still to be announced.